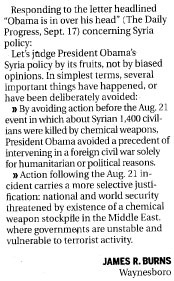 “Avoiding action before the August 21 event in which about 1,400 civilians were killed by chemical weapons, the President avoided a precedent of intervening in a foreign civil war solely for humanitarian or political reasons. “Action following the August 21 incident carries a more selective justification: national and world security threatened by existence of a chemical weapon stockpile in the Middle East, where governments are unstable and vulnerable to terrorist activity. “Mr. Obama’s decision that this threat justified military action gave Russia, Syria’s ally, strong motivation to seek peaceful resolution of the problem. Collaborating with the U.S., Russia appears to be taking major responsibility, easing the burden on us. Before the President’s decision, Russia had been complacent as the Syrian war went on for years, with casualties mounting to an estimated 100,000. His decision served an important purpose regardless of whether he personally wished for military action. “The President’s decision to request Congressional approval gained time – for the United Nations to verify that chemical weapons were used, and for the Russian initiative to progress to where it could be adopted or rejected. Further out, his decision gave a precedent for returning to the Constitutional requirement that Congress authorize acts of war – a measure more likely to build national unity. He avoided using the controversial War Powers Act that enabled presidents to wage war without Congressional declaration. “Those who charge Mr. Obama with incompetence would have us believe that he did not anticipate the firestorm by both parties in Congress, when asked to actually vote on the subject. It is easier to believe that his purpose matched his achievement, gaining time and observing Constitutional principles. “I note that the letter has been published in today’s Sunday Progress. However, you have published only 120 of the 349 words that I submitted. The last four paragraphs have been deleted. These are essential support for the points that I was trying to make. “It appears that when your letter was “copied” into the computer program we use to produce the newspaper, the latter portion did not transfer. “…The majority of readers, using the printed version, would not be affected by the remedy you are following. That was the end of the correspondence. As far as I know, the following version of the letter, severely shortened, remains as its only printed record. If I somehow missed a later correction of the error, I would welcome a comment by the Daily Progress setting the record straight. I place a high value on freedom of the press. I realize that it means many things to many people. I was surprised to find through this experience that there is one additional meaning for some people: That the press is not accountable, either to its contributors or its readers, for errors. There seems to be no obligation to correct or acknowledge them. Note: Another event involving “liberties” taken by the Daily Progress is described in a Note in the posting titled “Columnist fails to provide whole picture about Titanic Survival” (posted 5/6/2014).